Clam is a broad term often used for many types of bivalve mollusks. For our purpose here "clam pearl" will refer to both the tridacna clams, including the giant clam, found in the South Seas and to the hard quahog clam found in the Atlantic Ocean off of North America. Pearls from the tridacna clams and from the quahog clams are non-nacreous pearls. There was a time when these types of pearls were not even called pearls, but that has changed now. Non-nacreous pearls are very much pearls just like their nacreous cousins. Hubert Bari says this about non-nacreous pearls in his new Pearls Catalog "Here it is necessary to demolish an idea that is frequently encountered on websites and in books: the claim that only nacreous pearls should be called "pearls", while the others should be regarded as no more than 'concretions'. All the concretions produced by molluscs with shells are pearls, whether they are nacreous or not. They all have the same composition and are formed in the same way. Only the external appearance and the manner in which they react to light are different, which is not enough to justify differentiating one kind from the other in the nomenclature. In fact, the Gemological Institute of America has recently placed a ban on the differentiation between (nacreous)pearls and (non-nacreous) concretions. When you see the splendor of a Melo pearl, it is obvious that this distinction promoted by the lobbies of dealers in nacreous pearls is wholly unwarranted." Some tridacna pearls exhibit flame patterns that sparkle in the sun or any available light. They also often have extraordinary symmetry making them exceptional choices for rings and matching jewelry ensembles. Tridacna gigas or Giant Clam can be up to 1 meter and weigh up to 250 kg. It has four vertical folds and is in danger of extinction but the Australian Marine Force in 1993 launched a re-population program. The famous Pearl of Allah is from a giant clam and although this pearl holds the "official" Guinness World Record for size, I have seen photos of pearls from the giant clam up to 30 pounds in weight. 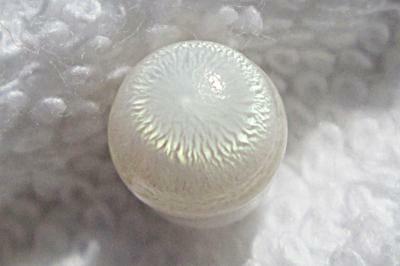 The pearls are normally opaque and come in a large variety of sizes and shapes and in mostly shades of white ranging into the browns and greys. 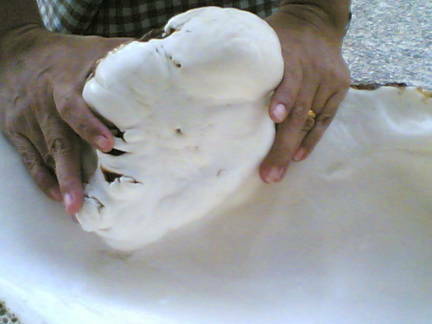 Pearl of Elias is an attached blister pearl of a giant clam. Tridacna squamosa or common clam is a fluted giant clam with glossy, translucent pearls with flame effects, made of prisms of aragonite, with a fine silk-like sheen, often only seen in reflected light. Most pearls contain an inner core or inner layers, made up of radially arranged calcite prisms. Tridacna mollusks are found in shallow coral reefs in tropical parts of Indo-Pacific Ocean. Specifc gravity for tridacna pearls is 2.80-2.90. GIA has posted news of this large tridacna pearl they have tested. Quahogs are found along the East coast from Canada to Georgia, especially on the coast of New England states. These are popular seasonal food item and are called Little Necks if small and the larger ones Cherrystones. They can even be found in my local grocery store here in Muscatine, Iowa. 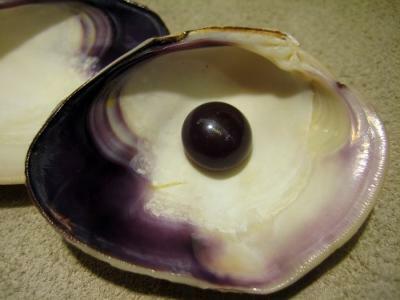 The purple part of the shell is used to make Wampum beads. 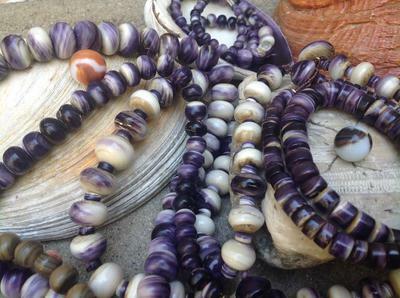 Quahog pearls range from white, reddish-brown, pink, purple or blackish and are very hard porcellaneous with gloss and the surface may show flame structure with a silk effect or a strange honeycomb structure made up of tiny irregularities. Quahog clam pearls specific gravity is 2.65. EGL in NYC appraises these between $200-800/carat. Thanks to these sources for most of this information Pearls by Hubert Bari and David Lam and Pearls by Elisabeth Strack.